Bob enjoys visiting schools and libraries. His presentations are 45 minutes to an hour long. In addition to telling stories, Bob shares his ideas with young people about how storytelling helps them to concentrate on the best ways to develop a story and eventually write it. He also helps students explore texts actively through role play. In addition to working with students, Bob conducts workshops for teachers in the areas of drama and poetry. Please feel free to contact him for more information about what he can do for your students or teachers and to discuss costs. Maximum audience size for storytelling performances - 100 students. Maximum size for workshops - 30. Click Here To Book An Appearance! Interested in having a professional author or storyteller drop by your school or business? Bob is a member of the Canadian Children's Book Centre (and a past board member), Canscaip, and the Writers' Union of Canada. 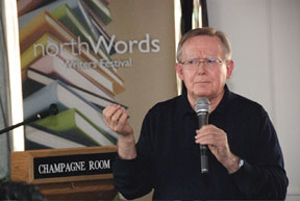 He is available as a visiting author through the Writers in the Schools Program of the Writers' Union of Canada.